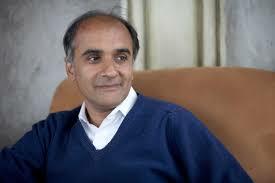 I heard about Pico Iyer and his highly acclaimed Video nights in Kathmandu, more than a quarter century ago. But somehow, the title didn’t appeal to me. Don’t ask me why. And so Iyer remained a quaint name in the far recesses of my mind for many years. Then came his Falling off the map ( first published in the US by Alfred Knopf in 1993). This one sounded intriguing. My fertile imagination made me visualise the countries mentioned in the book jostling for space to stay on the map, but kept being pushed out by the other and better known countries. Sometimes these countries fought with the lonely ones, making them sadder and lonelier! But the book remained right there – in my imagination because back then I couldn’t afford to buy new books and most of my purchases were restricted to second-hand bookshops. Alas, for Falling… to come to that sales outlet, I would have to wait a long, long while. Besides, travel books as a genre, did not hold much appeal for me. I liked James Michener’s Hawaii, but it was more a historical novel than a travel book. Till one day I picked up a small volume of Lost Continent by Bill Bryson. It was such a delightful read and made me laugh so much that I got hooked – not to travel books, but to Bryson. And Pico Iyer continued to remain a distant name, just like the countries he had written about in that book. 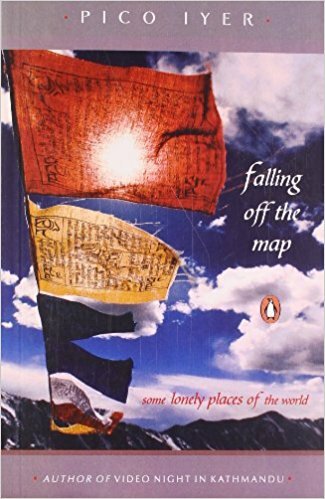 It took a session of #TSBC on travel books to remind me of that long-forgotten name and his book, and I promptly bought Falling off the Map (2004, Penguin Books India, pp.190, Price: 250/-) from Flipkart. It was well worth the wait – of nearly 20 years. I had read some reviews about the book that complained about it being too dated since the situation in many of the countries he has talked about has changed drastically in the interim. But I think that it only gives a historical perspective to the book. …..are the exceptions that prove every rule; they are ascetics, castaways, and secessionists; prisoners, anchorites and solipsists. ….Some are born to isolation, some have isolation thrust upon them. Each makes its own accommodation with wistfulness and eccentricity and simple institutionalized standoffishness. That said, he goes on to describe the places he has grouped together, and then meanders through the countries to unravel their isolation. The headings of the chapters say it all: “My holiday with Kim Il Sung”(North Korea); “La Dolce Vita meets ‘The Hyper’ ” (Argentina); “An elegiac carnival” (Cuba); “Hidden inside the hidden kingdom” (Bhutan); “Yesterday once more” (Vietnam); “Up for sale or adoption” (Paraguay); “Five thousand miles from anywhere” (Australia). For me, this book is less a travel book and more a sociological study of the times in the Lonely Places he has talked about. And Iyer, with his eye for the absurd and the unusual, provides interesting trivia, and with his knack for picking up the subtle nuances of the place and its people, enthralls with his prose. I love the uncanny and effortless way in which he looks beneath the surface to find the quirks that distinguish the place. So much so that, he gets ‘into the rhythm of the place’ after a few days of absorbing the oddities, and actually looks forward to visiting the place again. I would go as far as to say that it is a literary work unlike other travel books. For instance, his depiction of life in North Korea is surreal. Pyongyang with its empty streets and the monstrous concrete edifices, the people living under the illusion of the superiority of their country and their leader Kim Il Sung, brings North Korea alive in the reader’s eye. A land of dichotomies, where many world languages are spoken including Korean; where a lucrative baby adoption business thrives; where ‘everything is illegal.’ A corrupt place then, with an economically unequal society where extreme poverty and extreme affluence co-exist. A succession of presidents whose penchant for naming everything after themselves while erecting monuments and statues for themselves and who took huge cuts from, and often owned the franchises of foreign corporations — who set up shop there — remind us uncomfortably of our own highly corrupt politicians and their ways. The sad part however is that, while Paraguay has moved ahead, India is still stuck in that space. An inveterate traveler, Iyer has been travelling since he completed school, when he worked at a Mexican restaurant to save up enough money to travel for three months in South America, the Suriname and the West Indies. When he joined graduate school, he undertook a tour of 80 towns in 90 days for the guide-book series, Let’s Go. According to him, the difference between a tourist and a traveler is that the latter leaves his assumptions at home and the former complains that nothing is like home! As travel books go, this one might not add to the tourist traffic to these countries. But curiosity is definitely aroused. While some countries have tried climbing on to the map and are sitting there, there are some that still glory in their isolation and quirkiness, like Iceland and Bhutan. Having said all that in praise of the book, I found the use of other languages, which pepper each chapter, quite annoying. Whether French, Italian or Spanish, a glossary would have served well. But perhaps it is meant for a multi-lingual readership? But this minor peeve wouldn’t stop me from picking it up once again to savour the lyrical narrative and maybe even look up those words in other languages. And with that statement, I just officially dislodged Bryson from the top of my list of favourite travel writers! This review titled Lonely Places, Lyrical Prose had first appeared on My Favourite Things. I had been understandably nervous when Sudha asked me to do the review for her blog, as her reviews are excellent and I felt mine would fall way short of them. 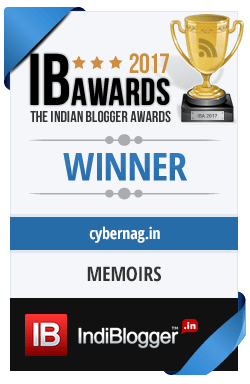 However, I wrote and she published and the response from readers gave me enough encouragement to do more reviews on Cybernag. Thank you Sudha, for first publishing this and then giving me permission to post it on my blog. Like you, I dont care much for travel books. And like you I love Billy Bryson’s delectable humor. And now you say Pico Iyer outshines Bryson! This I have to read now. The things that caught his eye, and the things that caught your, make the review a magnificent read. I can’t imagine someone writing benignly of North Korea! Of course this was 20 yrs ago, but still. Oh, Pico Iyer is so indulgent in his observations, not a jot of condescension, which is what I loved about it. And yes, he has found something to commend about N.Korea too, though it is not about the regime, thank God! That means you have not picked up any good travel book, Jaish! Start with Bryson or Pico Iyer. They will change your opinion about travel writing. An extensive review that touches aspects of travel and the author’s struggle right from working hard to explore places. I have never read a travel book but this review is giving me reasons to get one. I am glad my review is giving you the impetus to pick up a travel book. Do go for the better ones, as most travel books just end up being travel brochures with lists and listicles, which can be a big put off. ← On this Guru Purnima….